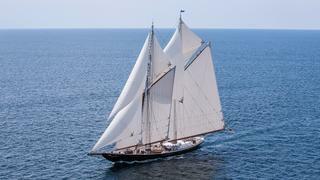 The 43 metre replica sailing yacht Columbia has been listed for sale by AJ MacDonald at IYC. Built with a steel hull at US yard Eastern Shipbuilding, she was delivered in 2014 as a replica of the classic Gloucester fishing schooner Columbia, designed by W Starling Burgess and delivered in 1923. The original Columbia was built as a pure fishing boat without such niceties as a saloon, guest cabins or an engine room and her navigation equipment consisted only of a compass and a barometer. When she was caught in a hurricane off Nova Scotia in August 1927 her shortcomings were exposed as she foundered with the loss of 25 crew. However, the replica is a different matter altogether and has state-of-the-art navigation equipment, air conditioning and all mod cons. The interior is in mahogany and accommodation is currently configured for up to 12 guests in four cabins consisting of a master and VIP with Pullman berths and two twins with bunks and Pullman berths. The open-plan main saloon of this yacht for sale has seating on comfortable settees to starboard, a dining area for ten guests to port, a bar, fridge, ice maker, wine cooler and an entertainment centre including a 46-inch HD television screen. A single 587hp Caterpillar diesel engine gives her a cruising speed of ten knots and a cruising range of 4,000 nautical miles. Lying in Panama City, Florida, Columbia is asking $16,900,000.